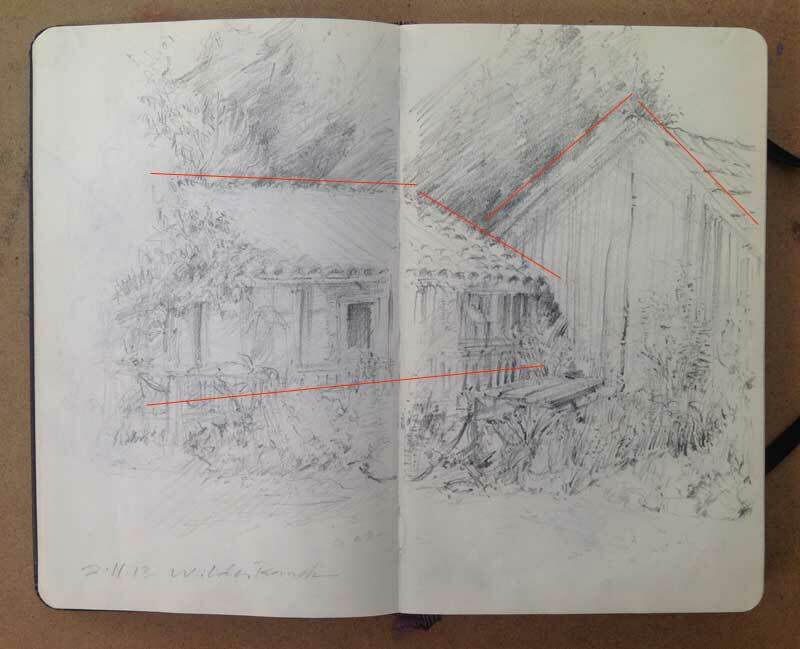 For the ranch buildings, shown above, I lightly sketched dominant angles (indicated with red) before drawing anything else. 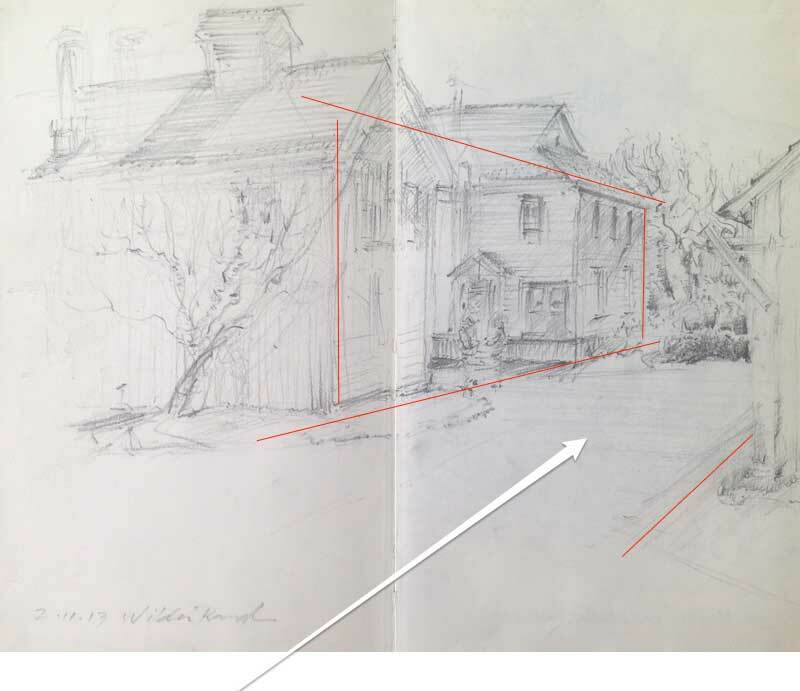 Dominant angles are the essential framework for sketching accurate 3D representations of buildings in a composition. Getting these foundational angles correct was crucial in giving a place for the viewer’s eye to travel into the depths of the sketch. Early on, when first mapping out a sketch, I establish vertical corners of buildings closest to me, making sure they are parallel to the edge of my page. The vertical corners serve as reference guidelines for comparing other vertical lines, such as windows and doors, checking that they are parallel to each other. Notice how vertical corners and dominant angles (shown above with red lines) create a rectangle, of which, the top and bottom lines appear to get closer together as they recede in the distance. Adding more vertical and angled lines creates a perspective grid (shown above). The grid helps you visualize the angles of the sides of the buildings and individual windows. The windows are drawn smaller as they get farther away, giving depth to the drawing. With practice, you’ll get accurate angles and shapes without having to sketch a grid. Don’t worry if details aren’t exact; the fun of urban and field sketching is in creating quick impressions of what you’re looking at. 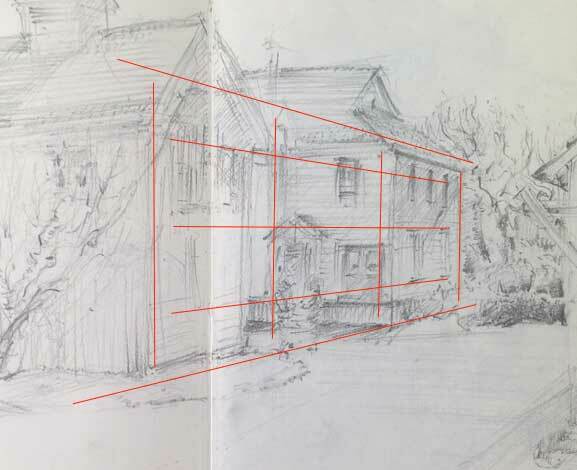 Depicting the illusion of depth in a sketch is a matter of taking time to get the angles of perspective correct before proceeding with other details. If you make this a habit your compositions will invite people to step into your sketchbook to take a stroll. How can I help you with sketching dominant angles? Email me. Want to learn more? Draw with me.